Does Menopause Affect Your Risk of Fibroids? 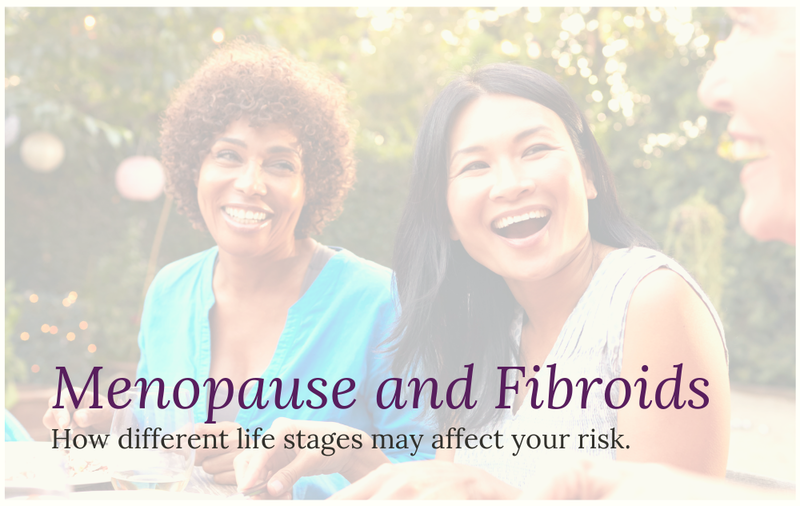 Home | Blog | Does Menopause Affect Your Risk of Fibroids? Can you have fibroids after 50? While they may shrink once you enter menopause, they can also continue to cause symptoms. Learn more about menopause and fibroids as well as discover your treatment options below. We don’t understand all the causes of fibroids, but research suggests that hormones have a role to play. The hormones estrogen and progesterone affect your uterine lining’s development throughout menstrual cycles and seem to impact fibroids. Fibroids have a higher number of progesterone and estrogen receptors than normal uterine muscle cells. During menopause, your estrogen and progesterone levels change. At first, the amount of estrogen in your body fluctuates, and then it drops to a low level. Your progesterone production slows as well. In many cases, fibroids that developed before menopause shrink because of these lower hormone levels. However, some women still experience fibroid symptoms after menopause. Will My Fibroids Shrink After Menopause? If you have uterine fibroids, you may think menopause will reduce your fibroid size and relieve your symptoms. Every woman has a different experience with menopause and fibroids, and you might find that you have fewer or no issues after having symptomatic fibroids before menopause. However, some women with fibroids can still experience heavy, prolonged bleeding and other symptoms. You may get fibroids after menopause even if none of these risk factors apply to you. It’s important to track changes and record your periods, so you know if your cycle changes. Regular examinations can help you detect fibroids and pursue a treatment option. How Does Menopause Change Fibroid Symptoms? If you notice these symptoms, you could have uterine fibroids. A medical professional can provide the diagnosis and treatment needed to give you relief. Do I Need a Different Treatment for Post-Menopausal Fibroids? Many of the treatments provided for fibroids after menopause resemble the ones used for pre-menopausal women. If you have post-menopausal fibroids, you can also choose a minimally invasive treatment: Uterine Fibroid Embolization (UFE), which can shrink your fibroids without surgery. UFE is a non-surgical procedure that utilizes the body’s natural pathways: the arteries, to treat fibroids. Interventional radiologists use advanced ultrasound technology to cut off blood supply to the fibroids, forcing them to starve and die. One of the benefits UFE offers women is that it does not interfere with hormones like a hysterectomy or hormone therapy does. Some other benefits are: low-risk of surgical complications, less risk of scarring or bleeding, preservation of the uterus, no hospital stay, and a shorter recovery. Women start menopause at different ages; therefore, you will need to consult with a fibroid specialist to determine if UFE is right for you. At USA Fibroid Centers, we provide minimally invasive treatments for women aged 18-64, giving them relief from uterine fibroids. If you think you have fibroid symptoms, we can help. We encourage you to take our online quiz to find out your chance of having fibroids. You can also schedule an appointment online at one of our many locations across the United States. At USA Fibroid Centers, we believe that fibroid treatment should be convenient and accessible to all; that’s why we have over 23 treatment facilities in 7 states from coast-to-coast. What are you waiting for? Get checked today!